The perfect combination of sweet, earthy, soft, crunchy and crispy. If the squid has been frozen, dry really well with some kitchen paper, then toss through with a little of the oil. Heat a little more oil in a frying pan, when really hot, flash fry the squid for 2 – 3 minutes, add the butter and continue to fry until crispy (another minute). Season with a little salt and freshly ground black pepper. Remove and set aside until ready to pull your salad together. Place the pan back over the heat, add the black pudding (or chorizo). You may need just a touch more oil. Fry until dark and crispy. Pop onto the same plate as the squid. Zest your orange, then over a bowl, with a sharp knife, skin your orange, then segment it, catching the juice for your dressing. 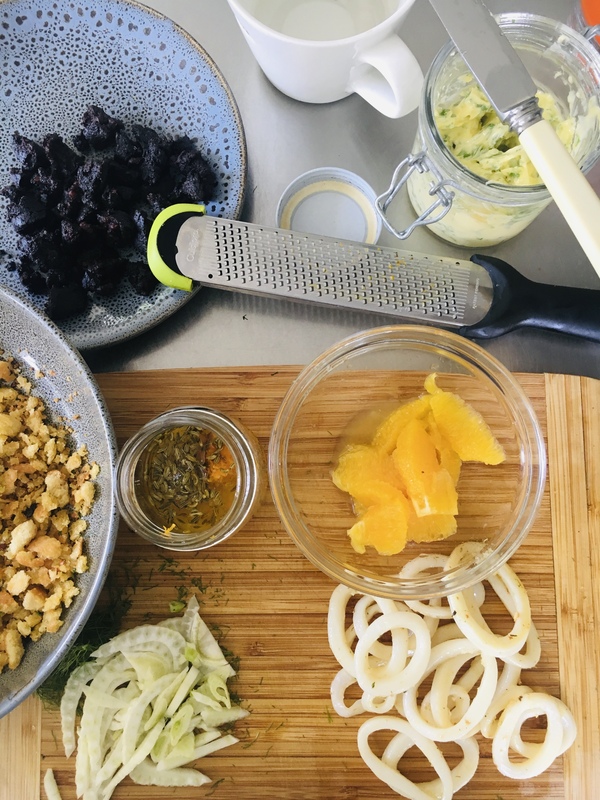 Whisk together or in a jar pop your 4 tbsp olive oil, zest and juice of the orange, dijon mustard and fennel seeds. Give it a good shake then taste and season. Wash and rip apart the lettuce. Place in a bowl with the fennel and drizzle over a little of your dressing, using your fingers, lightly toss them all together. Time for the big finish. 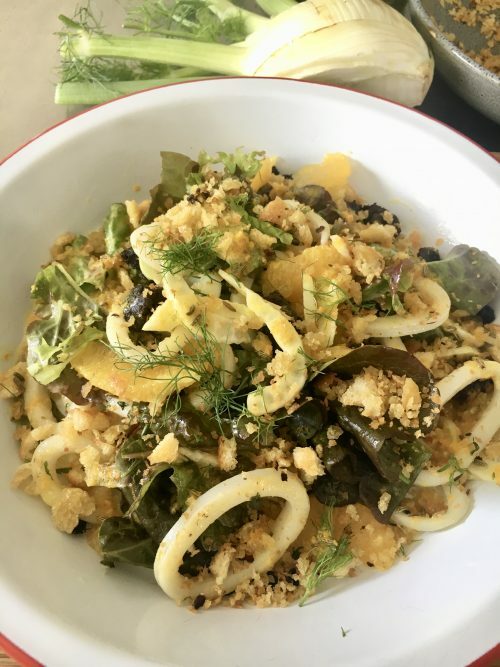 Pop your orange segments, squid and black pudding (chorizo) over the salad leaves, drizzle over the dressing. Toss together. Sprinkle over the breadcrumbs and enjoy. Jax Says : If you don’t like fennel use sliced cucumber instead with dried thyme instead of fennel seeds.